ZAOR Idesk is a unique workspace for musicians and producers that love style – resolutely modern design with unobstructed lines and a great flow. Using white and black gloss, and a no nonsense approach to functionality allows us to minimize clutter and keep to the essential elements in today’s production ambiente. By using high quality, dual component lacquers and manual sanding in a 5 layer process we give you a stylish and yet robust finish that is light years away from the dark control rooms of yesteryear. We have developed this line with one goal in mind: create a bright, friendly environment that invites you to work during long hours without fatigue. 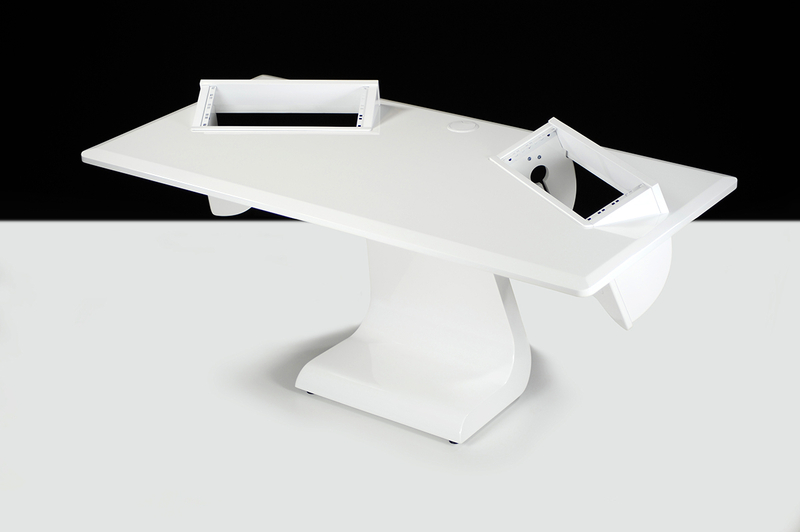 The central foot of the Idesk, with an incorporated cable canal is discreet yet strong enough to carry the desk and the rack units you might want to insert. Reinforced with solid wood in the right places, the design offers a unique combination of airiness and strength. An eye catcher indeed!